If you're looking for a shabby chic-inspired retreat, look no further than the Millhaven 4 piece king bedroom set. Available at RC Willey, its airy whitewashed finish over replicated grain is perfectly complimented with plank-style detailing on the tops. Its classic silhouettes and rustic charm lend to its inviting beach cottage vibe that you and your family are sure to love! If you're looking for a shabby chic-inspired retreat, look no further than the Millhaven king panel bed! 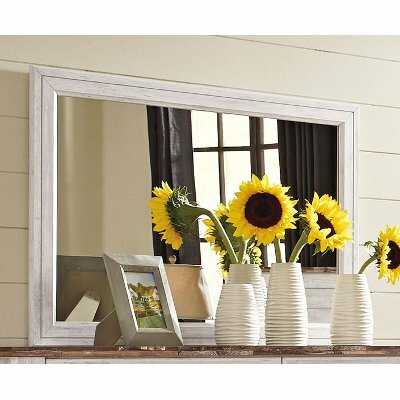 Available at RC Willey, its airy whitewashed finish over replicated grain is perfectly complimented with plank-style detailing on the tops. Its classic silhouettes and rustic charm lend to its inviting beach cottage vibe that you and your family are sure to love! If you're looking for a shabby chic-inspired retreat, look no further than the Millhaven 6-drawer dresser—now at RC Willey! 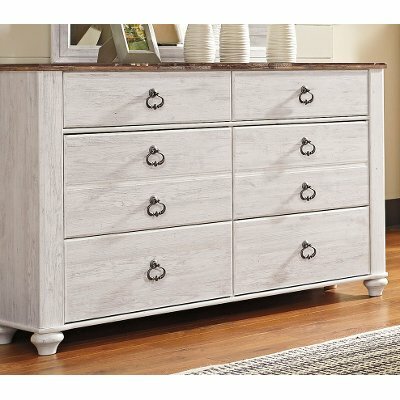 Its airy whitewashed finish over replicated grain is perfectly complimented with plank-style detailing on the tops. Its classic silhouettes and rustic charm lend to its inviting beach cottage vibe that you and your family are sure to love! 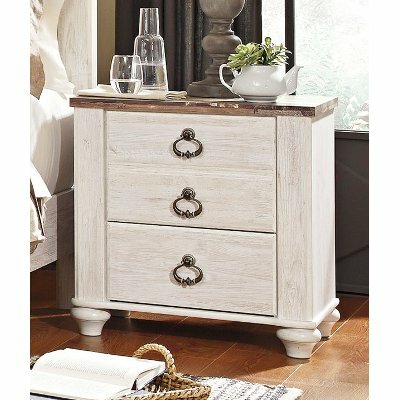 If you're looking for a shabby chic-inspired retreat, look no further than the Millhaven 2-drawer nightstand! 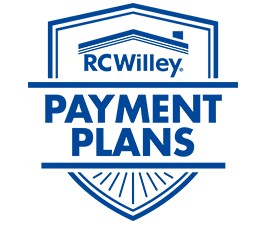 Now at RC Willey, its airy whitewashed finish over replicated grain is perfectly complimented with plank-style detailing on the tops. Its classic silhouettes and rustic charm lend to its inviting beach cottage vibe that you and your family are sure to love! 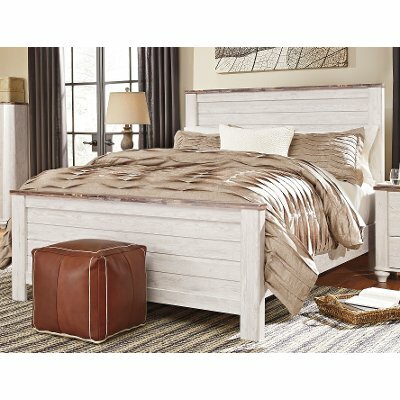 Classic Rustic Whitewashed 4 Piece King Bedroom Set - Millhaven is rated 5.0 out of 5 by 2. Rated 5 out of 5 by Shopkin Love this set Love this set. Looks even better in person. Great value for the price. Wanted something light and farmhouse rustic style since we had darker wood for years. Wanted something different and to lighten everything up. White down comforter and white curtains really add to the serene vibe.